In the state he made his home, there's no doubt McCain will forever be remembered and his name forever a major part in the story of Arizona. It was 1986 – the year John McCain was first elected to serve the great people of Arizona in the Senate. In an interview with 12 News, McCain, accompanied by his then toddler daughter, Meghan, made it clear that Arizona would be his home and he would not be disappearing anytime soon. “I think the people of Arizona will be seeing a great deal of me,” he said. More than three decades later, talking about modern-day Arizona history just doesn’t feel right without the mention of John McCain. The man and war hero has become almost synonymous with the Grand Canyon State. 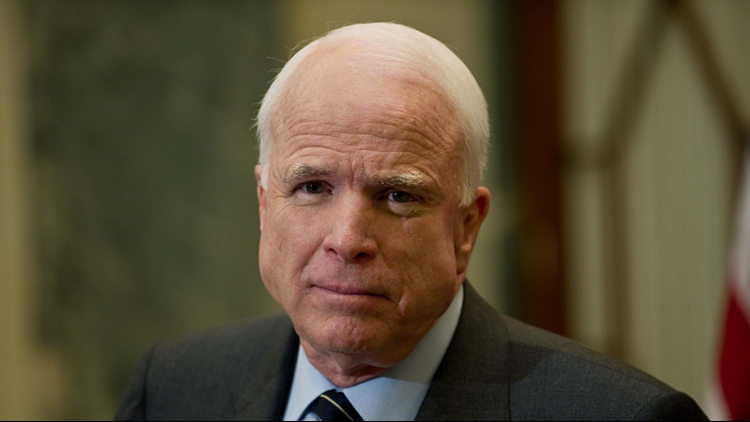 McCain passed away on August 25 just days before his 82nd birthday. But the senator left behind a legacy in Arizona that goes far beyond politics. “I think there are those of us that are new to Arizona that feel unfortunate that we were not privileged enough to be born here and lived here,” McCain once said. Actually, McCain was born pretty far from it. Over 3,000 miles away from Arizona, for those keeping count, in the Panama Canal Zone. In his HBO documentary, “John McCain: For Whom the Bell Tolls,” McCain said the injuries he suffered during his years spent as a POW in Vietnam put a “ceiling” on his future in the Navy. “I had to make a tough decision,” he said. He decided, since he wasn’t “going to be able to reach all the heights” that he wanted to, he’d get out of the Navy. It was that “tough decision” that led him to Arizona. But, unlike his wife whose family made their fortune in Arizona, McCain wasn’t a true Arizonan. 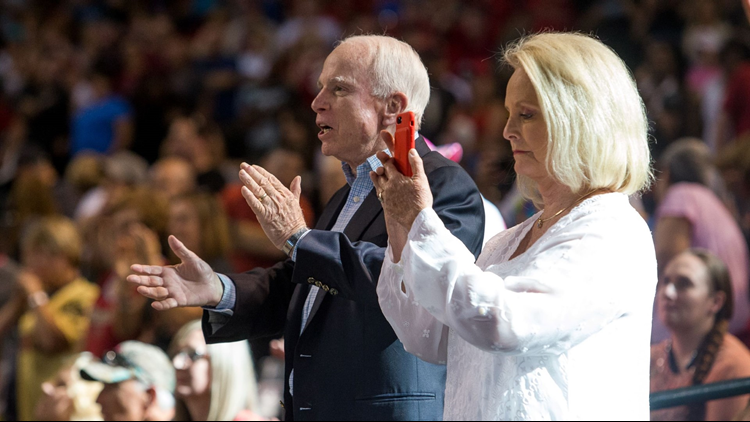 “One of the first things I remember was a gentleman at a rotary club that said ‘well you’re not from Arizona, what do you know about Arizona, you’re not a native Arizonan,’” Cindy McCain said in her husband’s HBO documentary. "Listen, pal. I spent 22 years in the Navy. My grandfather was in the Navy. We in the military service tend to move a lot. We have to live in all parts of the country, all parts of the world. I wish I could have had the luxury, like you, of growing up and living and spending my entire life in a nice place like the first district of Arizona, but I was doing other things. As a matter of fact, when I think about it now, the place I lived longest in my life was Hanoi." McCain was elected after that first campaign and many more times after that. And soon Hanoi was no longer that place where he had lived the longest. “I was nearly forty-five years old before I could claim a hometown. My ambitions brought me to Arizona, and my work keeps me away from here for more than half my time," McCain wrote for the celebration of the state's Centennial. "But Arizona has given me a home, and in the thirty years that have passed since I moved here, it has worked its magic on me and enchanted me and claimed me." “I obviously have small children that I want to grow up in Arizona and not in Washington,” McCain said in that same 1986 interview with 12 News. McCain commuted from Arizona to Washington D.C., Cindy said in the documentary, and “he never missed a weekend” with his family. “When John was first elected and we started having children. It was a conscience decision by both of us to raise our children in Arizona,” Cindy McCain said in the HBO documentary. Arizona’s senior senator lived much of his political career right in Valley, in the family’s north-central Phoenix home. A house he once gave tours of to raise money for a local Phoenix school. "I kind of got into being a tour guide,” McCain told Architectural Digest in 2005. “Here's a picture of my father on Midway Island, with Nixon. And look at this rug. And here are some dolls from Mexico." But northern Arizona always seemed to be McCain’s favorite place, at the family’s beloved spread near Sedona as well as in the Grand Canyon. Great hike with @meghanmccain in beautiful #Arizona this morning - thanks for all your messages of support! Sedona is the spot the McCain Institute holds its annual Sedona Forum with big shots from all over the world. And McCain has long been a big promoter of the Grand Canyon and has hiked there many times. Actually, the Arizona Republic once wrote, the senator has hiked almost every single Arizona trail – the known and not so known. During the state's 100-year celebration, McCain wrote “I’ve experienced every scene of spectacular beauty this blessed, bountiful, beautiful state possesses." "I’ve hiked Canyon de Chelly, Chiricahua, and rim to rim in the greatest of our natural wonders, the Grand Canyon. I’ve rafted down the Colorado. I’ve walked the trails of Saguaro National Park; been struck mute by the awe-inspiring landscape of Monument Valley; and spent countless happy hours following hidden paths in our wilderness areas," McCain said. "I’ve houseboated on Lake Powell. Many times, I’ve driven through the desert in spring after a wet winter and felt myself become emotional as I marveled at the profusion of vivid colors, the mesmerizing beauty of desert wildflowers in bloom." In April, Sen. McCain was honored, alongside Rep. Morris Udall, for his work protecting the Grand Canyon. In recent days, McCain often captured the beauty of the state in photos from his home near Sedona – a place where over the years he entertained staff, friends, potential running mates and even journalists cooking “the world's best ribs” on the patio. Cooking the world's best ribs at the cabin in Cottonwood! The family's home near Sedona is where the senator spent his final days, "in the place he loved best," Cindy McCain tweeted. “The sacrifices John McCain has made for our country, and especially the men and women he served with in the military, are incredible,” Larry Fitzgerald wrote in a touching letter about McCain published in December. If you asked McCain what his favorite sports memory was, he’d probably say Game 7 of the World Series when the Arizona Diamondbacks topped the Yankees on the bat of Luis Gonzalez. He actually threw out the first pitch at that game – one of, if not, the biggest games in Arizona sports history. 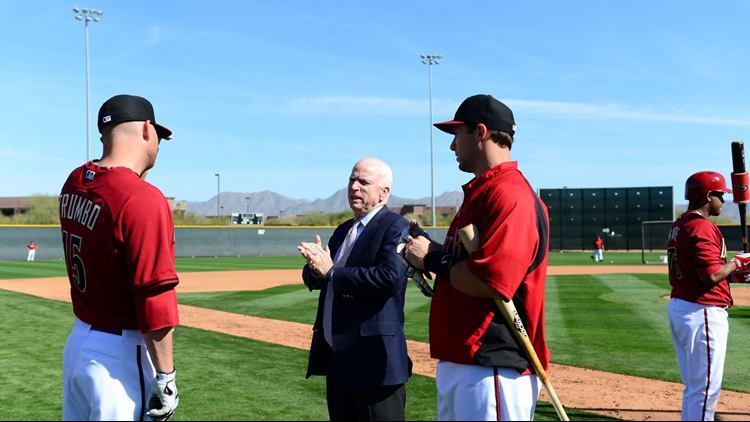 McCain loved the D-backs and was one of the team's biggest fans. According to the New York Times, he had actually swapped, not too long ago, his flip phone for an iPhone for the MLB app to "better follow his Arizona Diamondbacks." He spent many memorable nights at the ballpark in stands when it was BoB and many more when it became Chase Field. It was a place he visited shortly after beginning treatment for his brain cancer. 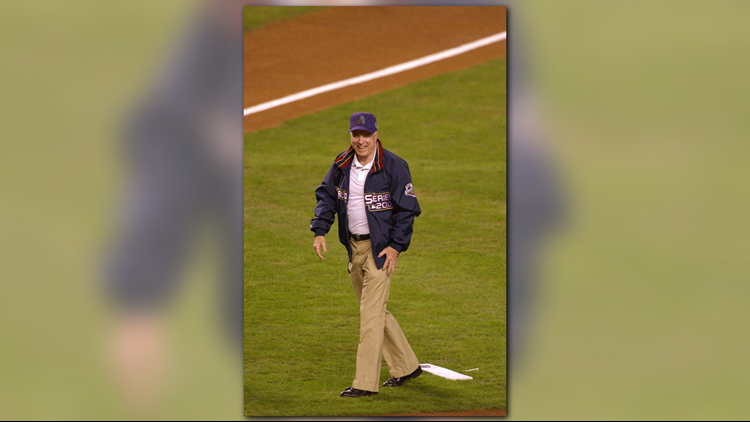 Following his death, the Arizona Diamondbacks said they were lucky to call McCain a loyal fan. While his love for the D-backs may have been number one, the Arizona Cardinals were a close second. The Cards said, "the world will never be the same without the voice of Senator John McCain." Bruce Arians, the team's former head coach, tweeted "one of my proudest moments as @AZCardinals head coach was standing with you for our National Anthem." Senator John McCain-Gone but never forgotten. A true American hero. RIP my friend! Like the D-backs, McCain spent plenty of time with the Cards over the years, getting to know the players, including the man who wears 11, his dear friend and Arizona sports legend, Larry Fitzgerald. Thanks @azcardinals for having me at your final #cardscamp practice - looking forward to a strong season! Following the senator's death, Fitz tweeted, "Rest in peace to an American hero, statesman, servant of the people, and dear friend." 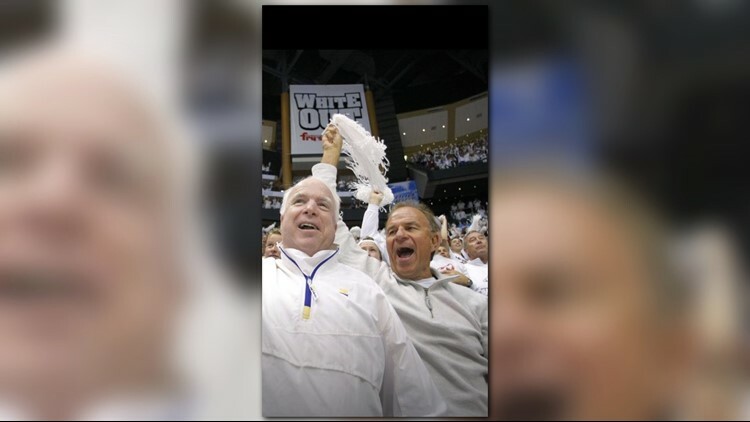 McCain supported nearly every Arizona team, from the Arizona Coyotes to the Phoenix Suns, ASU and UofA. “Senator McCain has given so much of himself to our country, to Arizona and to Phoenix. Giving something back to an American hero, a former naval aviator, and a 30-year member of the U.S. Senate is the least we can do,” former Phoenix mayor Greg Stanton said. Terminal 4 at Sky Harbor and several places around the state bear the name of another famous Arizona senator: Barry Goldwater. McCain was his successor and Terminal 3 will forever be known as the John McCain terminal. At the time, McCain said he was unworthy of such an honor. But for the man who gave so much for his country and whose name will continue to do so through the McCain Institute and USS John S. McCain (named also after his father and grandfather) there may be, just like Goldwater, a lot more to come in the future. In an interview with 60 Minutes, just a few months after his cancer diagnosis, McCain said he wanted to be remembered as a man who served his country. "I am so grateful. Every night when I go to sleep, I am just filled with gratitude," he said. And in the state he made his home, there’s no doubt McCain will forever be remembered and his name forever a major part in the story of Arizona.